Laura Theodore cooks up delicious, healthy meals and snacks without dairy, meat, or eggs...no animal products. All of her recipes are completely cholesterol free! 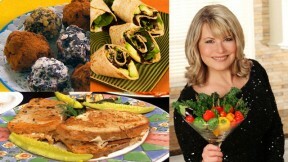 Her colorful, flavorful buffet wins over everyone who likes to eat, from dedicated vegans to hard-core carnivores. Her step-by-step instructions make preparing healthy food easy. Her eco-friendly tips help viewers live a more balanced, sustainable lifestyle. From “Festive Zucchini Lasagna” to “Dazzling Chocolate Desserts,” Laura leads the viewer on a down-to-earth path to a heavenly feast.